Osprey catching fish from pond of tarahara,it hunts once a day. Vultures battle for a cow carcass as they feed at a vulture restaurant in Nawalparasi, southwest of Kathmandu February 2, 2012. The restaurant, established in 2006 to provide a place where vultures can feed healthily, aims to boost the population of wild vultures which are considered an endangered species in Nepal. A man sails his boat in Rapti river in Sauraha, Chitwan, 170 kilometers (106 miles) south of Katmandu, Nepal. Follow me and thou shall be led. The frog under water was taken in Antu Pokhari, fikkal, Illam. Illam is famous for tea cultivation..
Sunrise in Bardia National Park. Tourist camp in Lauribina (Alt.-3900 mtr), Rasuwa district. making love between each other. Machhapuchre (Mt. Fishtail) seen during the late schedule of the trekking. One of the beautiful mountain of the world has so much to offer with its variety of glances which has admired me though its on my sight every single day of my life. Players celebrating the final day of the 29th World Elephant Polo Championships at Megauli, Chitwan. The feet of a child is seen as she is being balanced on a wooden prong planted into a chariot, during a procession to celebrate "Trishul Jatra" or Tridents Festival, at Jayabageshwari in Kathmandu June 23, 2011. The festival is celebrated by Hindu devotees and parents who believe their children will be blessed with good health after participating in rituals. Real MOUNTAIN Biking in the Mighty Himalayas There is no better experience than mountain biking in the laps of the mighty Himalayas; some of the worlds highest mountains. Mountain biking is catching up to become a popular tourism product in Nepal with large potentials from biking culture countries in Europe and North America. Tourist are enjoying taking picture of Mt. Everest and Lhoste from Syanboche 3800m. Beauty:- Reflection of Mt. Annapurna in the little pond made by the rain attracts thousands of tourist every year in Annapurna trekking route. The GosainKunda (4380 m ) -dramatic impression on the majestic Lake . Trekker..pose at one's own risk ! Sultan Ahmed wicket keeper of Oman national team in action in the match played against Nepal during the ICC World T20 pre Qualifying match which was held in Kathmandu nepal . With the stage set in Kathmandu for the pre-qualifying tournament of the ICC World Twenty20 in the first week of December 2011, Nepal’s place in the Cricket World Cup is in prospect. Nepal host the ACC Twenty20 Cup from December 1 to 10. The event is one of the qualifiers for the World T20 2012 to be held in Sri Lanka. Top three teams, except Afghanistan, from ACC T20 Cup will qualify for 16-team World T20 qualifiers to be held in early 2012 in UAE. Afghanistan, along with five top Associate nations with ODI status, namely Canada, Ireland, Kenya, the Netherlands and Scotland are automatically qualified for the qualifier that will also feature two other teams from Europe, Africa and America as well as the top team from East Asia-Pacific region. The top six teams of the World T20 Qualifier will qualify for the ICC World T20 in 2012. Devaka Khadkai of Surunga,Jhapa district came to Foreign Ministry, Kathmandu, Nepal on March 25,2012 to claim insurance of his husband Kul Bahadur Khadka who died in Qatar eight years ago. Everyday more than 2000 people migrate to work and three dead bodies arrives from gulf countries and Malaysia. Nepalese woman removing bricks of the damaged hose to make a way to pedestrians after an earthquake in Bhaktapur, on the outskirts of in Katmandu, Nepal,Monday, Sept. 19, 2011. A strong earthquake shook northeastern India and Nepal on Sunday night, killing at least 16 people, damaging buildings and sending lawmakers in Nepal's capital running into the streets. A speedometer is seen amid the wreckage of a passenger bus which swerved from the road and fell into the Sunkoshi river bank at Jhagajholi, in Sindhuli district, some 56 miles (90 km) from Kathmandu, October 13, 2011. At least 42 passengers were killed and 16 others injured when an overcrowded passenger bus travelling along the BP Highway swerved from the road and fell into the Sunkoshi river bank at Jhagajholi. A Young devotee jumps to save elderly devotee, who fell in the Bagmati river while taking holy dip during a Father day, in gokarnewor shrine , near Kathmandu, Nepal. 08 September 2011. To commemorate late father devotees from various part of country gathered at the sacred shrine of Lord Shiva, Gokarneswor On 'Father's Day'. The Young guy has succeeded to save him. 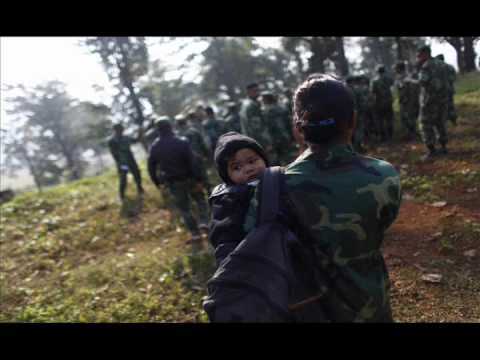 A former Maoist rebel carries her child and gathers along with other combatants for an integration program at Shaktikhor Cantonment in Chitwan, about 220 kilometers (140 miles) southwest of Katmandu, Nepal, Saturday, Nov. 19, 2011. Government monitors in Nepal began interviewing 19,000 former communist rebel fighters Saturday in the camps they have lived in for five years. The interviews are to determine who will join the national army and who will go for voluntary retirement (return home with cash to start new lives). The former Maoist fighters have lived in seven camps spread across Nepal since ending their bloody revolt in 2006.Although 9705 Maoist rebel had chosen integration during the regrouping process they were given a second chance to choose voluntary retirement which turns out the final number of rebel who chose integration is around 3194 in April 18 2012.By this Nepal has final hope to get a end of the peace process. A worker at tunnel of Ambathan Adit, Melamchi Water Supply Project. After a decade long debate, Melamchi Water Supply Project has now taken it\'s speed and expected to complete by the end of 2013. A woman swims towards eatery in jammed water at Gwarko Lalitpur after drainage had been blocked due to continuous heavy rain fall on Friday, July 01, 2011. According to Metrological forecasting division in July 2011 total rainfall 421.6 mm while Normal rainfall this month is 356.6 mm in valley which is 65mm extra rainfall then normal. Chinese prime minister ben jia bao nepal bhraman ma aauda receive garna airport pugeka pararastra mantralayaka karyabahak sachib muktinath bhatta chinese prime ministerlai kammar ma samatera tandai. Bike and Taxi riders queue at Ripumardini Petrol Pump in Bhadrakali, Kathmandu on Sunday, 1 January 2012. Nepal has been facing petroleum crisis since few years as the only petroleum product supplier, Nepal Oil Corporation is in loss as it is supplying in cheaper price. The dead body of the victim of the bomb explosion lying on the ground covered with the cloth outside Nepal Oil Corporation (NOC) in Babarmahal, Kathmandu on 27 February 2012. Three persons died and seven others were injured in a powerful explosion at the gate of NOC, which lies only few meters away from Singhadurbar. A lady outside the door of Shova Bhagwati Temple, Kathmandu. The door was closed due to the cleaning of the temple premise for the arrival of President of Nepal, Dr. Ram Baran Yadav on the day of Maha Astami, Dashain. Sanu kannchi danuwar, 37 of Dukuchap V D C ward no .2, Lalitpur walks crying in front of her house in Lalitpur on March 06, 2012. 4 houses were destroyed by the fire that was triggered by a small fire amidst dry shrubs just below the settlement at around 2:30 in the afternoon. Locals and police took the fire under control with soil and water thrown from pots after around two and hours before a fire truck reached the site that is around 10 kilometers away from Bungmati buspark, Lalitpur. Fire fighters and security personnel try to extinguish fire at the eastern side of Tribhuvan International Airport on February 07, 2012. National and international flights were affected due to the fire that started from bushes near the Pepsicola Town Planning adjoining. Co-operation: You supported when we felled down, it\'s our turn now. A Nepalese woman carries her child on her back works in a brick factory in Bungmati on the outskirt of Kathmandu on March 12 2012. A pupil doing her school homework. A homeless child is about pluge into the Bagmati River to escape the escalating heat of the capital city. Kathmandu, Nepal. Children sit on top of their luggage waiting to be fetched during an early morning in Lalitpur August 12, 2011. Heath is Wealth ! Local People of kathmandu valley busy on yoga and mediations session from early morning 5 am to 7 pm .which has become very popular now a days for health purpose is conduct by swami ram dev ji followers at renown place of valley , Tundhikhel . That was become a daily duty of local peoples . A man carries ducks in a shopping bag as he heads back home from a livestock market in Kathmandu October 3, 2011. Nepali porters walk for weeks, carrying supplies heavier than their own body weight. They do not sit down when they rest but rely on the wooden stuff to prop up the baskets, and earning not more than 70 US dollars per month. I may look fascinating for photographers but what to do; this is my daily routine for living. Two school girls enjoying monsoon rain while returning from school at Basantapur in Kathmandu. ‘Magar’ community woman rest in a cramp space in ‘Satdobato’ rented room during the third day of death ritual of there relatives. Woman of ‘Magar’ community largely took part in death ritual while there male counterpart seems few due to better employment opportunity to the foreign. Local residents of Dattatraya, Bhaktapur taking out water from the well. Water scarcity has been a serious problem due to rapid urbanization. JanakpurJainargar Railway in Janakpur, where people in theirdaily life are always forced to do such risky journey. Mountain Life:- This picture reflects the typical lifestyle of Sherpa People where husband is always out on work and mother is always working in the season time . A Man Exercising early in the morning on top of a hill near Airport, Kathmandu, Nepal. Villager crossing the river in Bardia National Park. A child worker of a roadside tea stall in Basantapur watches sadly a girl of his age going to school.